105 days. Capsicum annuum. Open Pollinated. Plant produces good yields of ½" long by ¼" wide hot peppers. 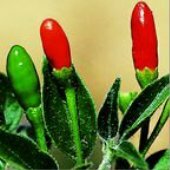 Peppers are extremely hot and turn from green, to orange-red, to red when mature. Plant has green stems, green leaves, and white flowers. A variety from Thailand. Very hot pickled, lots of friends and family could not get enough of these peppers. I think they even ate them at breakfast in omelets. They are very good in chili.